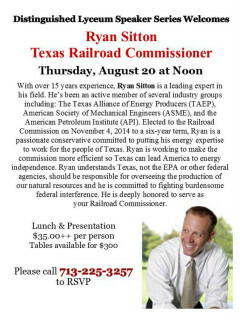 The Distinguished Lyceum Speaker Series will welcome Ryan Sitton, Texas Railroad Commissioner. Sitton, a native Texan, is a graduate of Texas A&M in Mechanical Engineering. In 2006 Sitton and his wife, Jennifer, founded PinnacleAIS, an engineering and technology company focused on reliability and integrity programs for the oil, gas, and petrochemical industries. Sitton has been an active member of several industry groups including: The Texas Alliance of Energy Producers (TAEP), American Society of Mechanical Engineers (ASME), and the American Petroleum Institute (API). $35 per person; tables for $300.